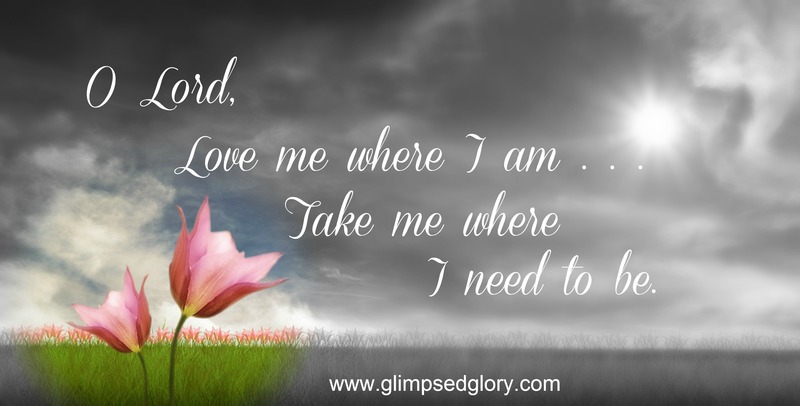 In the next 40 days (15 now because you have already accomplished twenty-five), the weeks leading up to Easter, the posts on Glimpsed Glory will be different. I am reading through the New Testament during this time and I am hoping the Holy Spirit will lead me to a fresh revelation each and every day. I’m going into it with a prayerful heart and an expectant spirit but I will fully confess to you that my soul feels sluggish. Am I not an apostle (a special messenger)? Am I not free (unrestrained and exempt from any obligation)? Have I not seen Jesus our Lord? Are you [yourselves] not [the product and proof of] my workmanship in the Lord? 2 Even if I am not considered an apostle (a special messenger) by others, at least I am one to you; for you are the seal (the certificate, the living evidence) of my apostleship in the Lord [confirming and authenticating it]. 3 This is my [real ground of] defense (my vindication of myself) to those who would put me on trial and cross-examine me. 4 Have we not the right to our food and drink [at the expense of the churches]? 5 Have we not the right also to take along with us a Christian sister as wife, as do the other apostles and the Lord’s brothers and Cephas (Peter)? 6 Or is it only Barnabas and I who have no right to refrain from doing manual labor for a livelihood [in order to go about the work of the ministry]? 7 [Consider this:] What soldier at any time serves at his own expense? Who plants a vineyard and does not eat any of the fruit of it? Who tends a flock and does not partake of the milk of the flock? 8 Do I say this only on human authority and as a man reasons? Does not the Law endorse the same principle? 9 For in the Law of Moses it is written, You shall not muzzle an ox when it is treading out the corn. Is it [only] for oxen that God cares? 10 Or does He speak certainly and entirely for our sakes? [Assuredly] it is written for our sakes, because the plowman ought to plow in hope, and the thresher ought to thresh in expectation of partaking of the harvest. 11 If we have sown [the seed of] spiritual good among you, [is it too] much if we reap from your material benefits? 12 If others share in this rightful claim upon you, do not we [have a still better and greater claim]? However, we have never exercised this right, but we endure everything rather than put a hindrance in the way [of the spread] of the good news (the Gospel) of Christ. 13 Do you not know that those men who are employed in the services of the temple get their food from the temple? And that those who tend the altar share with the altar [in the offerings brought]? 14 [On the same principle] the Lord directed that those who publish the good news (the Gospel) should live (get their maintenance) by the Gospel. 15 But I have not made use of any of these privileges, nor am I writing this [to suggest] that any such provision be made for me [now]. For it would be better for me to die than to have anyone make void and deprive me of my [ground for] glorifying [in this matter]. 16 For if I [merely] preach the Gospel, that gives me no reason to boast, for I feel compelled of necessity to do it. Woe is me if I do not preach the glad tidings (the Gospel)! 17 For if I do this work of my own free will, then I have my pay (my reward); but if it is not of my own will, but is done reluctantly and under compulsion, I am [still] entrusted with a [sacred] trusteeship and commission. 18 What then is the [actual] reward that I get? Just this: that in my preaching the good news (the Gospel), I may offer it [absolutely] free of expense [to anybody], not taking advantage of my rights and privileges [as a preacher] of the Gospel. 19 For although I am free in every way from anyone’s control, I have made myself a bond servant to everyone, so that I might gain the more [for Christ]. 20 To the Jews I became as a Jew, that I might win Jews; to men under the Law, [I became] as one under the Law, though not myself being under the Law, that I might win those under the Law. 21 To those without (outside) law I became as one without law, not that I am without the law of God and lawless toward Him, but that I am [especially keeping] within and committed to the law of Christ, that I might win those who are without law. 22 To the weak (wanting in discernment) I have become weak (wanting in discernment) that I might win the weak and overscrupulous. I have [in short] become all things to all men, that I might by all means (at all costs and in any and every way) save some [by winning them to faith in Jesus Christ]. 23 And I do this for the sake of the good news (the Gospel), in order that I may become a participator in it and share in its [blessings along with you]. 24 Do you not know that in a race all the runners compete, but [only] one receives the prize? So run [your race] that you may lay hold [of the prize] and make it yours. 25 Now every athlete who goes into training conducts himself temperately and restricts himself in all things. They do it to win a wreath that will soon wither, but we [do it to receive a crown of eternal blessedness] that cannot wither. 26 Therefore I do not run uncertainly (without definite aim). I do not box like one beating the air and striking without an adversary. 27 But [like a boxer] I buffet my body [handle it roughly, discipline it by hardships] and subdue it, for fear that after proclaiming to others the Gospel and things pertaining to it, I myself should become unfit [not stand the test, be unapproved and rejected as a counterfeit]. For I do not want you to be ignorant, brethren, that our forefathers were all under and protected by the cloud [in which God’s Presence went before them], and every one of them passed safely through the [Red] Sea, 2 And each one of them [allowed himself also] to be baptized into Moses in the cloud and in the sea [they were thus brought under obligation to the Law, to Moses, and to the covenant, consecrated and set apart to the service of God]; 3 And all [of them] ate the same spiritual (supernaturally given) food, 4 And they all drank the same spiritual (supernaturally given) drink. For they drank from a spiritual Rock which followed them [produced by the sole power of God Himself without natural instrumentality], and the Rock was Christ. 5 Nevertheless, God was not pleased with the great majority of them, for they were overthrown and strewn down along [the ground] in the wilderness. 6 Now these things are examples (warnings and admonitions) for us not to desire or crave or covet or lust after evil and carnal things as they did. 7 Do not be worshipers of false gods as some of them were, as it is written, The people sat down to eat and drink [the sacrifices offered to the golden calf at Horeb] and rose to sport (to dance and give way to jesting and hilarity). 8 We must not gratify evil desire and indulge in immorality as some of them did—and twenty-three thousand [suddenly] fell dead in a single day! 9 We should not tempt the Lord [try His patience, become a trial to Him, critically appraise Him, and exploit His goodness] as some of them did—and were killed by poisonous serpents; 10 Nor discontentedly complain as some of them did—and were [a]put out of the way entirely by the destroyer (death). 11 Now these things befell them by way of a figure [as an example and warning to us]; they were written to admonish and fit us for right action by good instruction, we in whose days the ages have reached their climax (their consummation and concluding period). 13 For no temptation (no trial regarded as enticing to sin), [no matter how it comes or where it leads] has overtaken you and laid hold on you that is not common to man [that is, no temptation or trial has come to you that is beyond human resistance and that is not [b]adjusted and [c]adapted and belonging to human experience, and such as man can bear]. But God is faithful [to His Word and to His compassionate nature], and He [can be trusted] not to let you be tempted and tried and assayed beyond your ability and strength of resistance and power to endure, but with the temptation He will [always] also provide the way out (the means of escape to [d]a landing place), that you may be capable and strong and powerful to bear up under it patiently. 16 The cup of blessing [of wine at the Lord’s Supper] upon which we ask [God’s] blessing, does it not mean [that in drinking it] we participate in and share a fellowship (a communion) in the blood of Christ (the Messiah)? The bread which we break, does it not mean [that in eating it] we participate in and share a fellowship (a communion) in the body of Christ? 17 For we [no matter how] numerous we are, are one body, because we all partake of the one Bread [the One Whom the communion bread represents]. 18 Consider those [physically] people of Israel. Are not those who eat the sacrifices partners of the altar [united in their worship of the same God]? 19 What do I imply then? That food offered to idols is [intrinsically changed by the fact and amounts to] anything or that an idol itself is a [living] thing? 20 No, I am suggesting that what the pagans sacrifice they offer [in effect] to demons (to evil spiritual powers) and not to God [at all]. I do not want you to fellowship and be partners with diabolical spirits [by eating at their feasts]. 21 You cannot drink the Lord’s cup and the demons’ cup. You cannot partake of the Lord’s table and the demons’ table. 23 All things are legitimate [permissible—and we are free to do anything we please], but not all things are helpful (expedient, profitable, and wholesome). All things are legitimate, but not all things are constructive [to character] and edifying [to spiritual life]. 24 Let no one then seek his own good and advantage and profit, but [rather] each one of the other [let him seek the welfare of his neighbor]. 25 [As to meat offered to idols] eat anything that is sold in the meat market without raising any question or investigating on the grounds of conscientious scruples, 26 For the [whole] earth is the Lord’s and everything that is in it. 27 In case one of the unbelievers invites you to a meal and you want to go, eat whatever is served to you without examining into its source because of conscientious scruples. 28 But if someone tells you, This has been offered in sacrifice to an idol, do not eat it, out of consideration for the person who informed you, and for conscience’s sake— 29 I mean for the sake of his conscience, not yours, [do not eat it]. For why should another man’s scruples apply to me and my liberty of action be determined by his conscience? 30 If I partake [of my food] with thankfulness, why am I accused and spoken evil of because of that for which I give thanks? 31 So then, whether you eat or drink, or whatever you may do, do all for the honor and glory of God. Pattern yourselves after me [follow my example], as I imitate and follow Christ (the Messiah). 2 I appreciate and commend you because you always remember me in everything and keep firm possession of the traditions (the substance of my instructions), just as I have [verbally] passed them on to you. 3 But I want you to know and realize that Christ is the Head of every man, the head of a woman is her husband, and the Head of Christ is God. 4 Any man who prays or prophesies (teaches, refutes, reproves, admonishes, and comforts) with his head covered dishonors his Head (Christ). 5 And any woman who [publicly] prays or prophesies (teaches, refutes, reproves, admonishes, or comforts) when she is bareheaded dishonors her head (her husband); it is the same as [if her head were] shaved. 6 For if a woman will not wear [a head] covering, then she should cut off her hair too; but if it is disgraceful for a woman to have her head shorn or shaven, let her cover [her head]. 7 For a man ought not to wear anything on his head [in church], for he is the image and [reflected] glory of God [[a]his function of government reflects the majesty of the divine Rule]; but woman is [the expression of] man’s glory (majesty, preeminence). 8 For man was not [created] from woman, but woman from man; 9 Neither was man created on account of or for the benefit of woman, but woman on account of and for the benefit of man. 10 [b]Therefore she should [be subject to his authority and should] have a covering on her head [as a token, a symbol, of her submission to authority, [c]that she may show reverence as do] the angels [and not displease them]. 11 Nevertheless, in [the plan of] the Lord and from His point of view woman is not apart from and independent of man, nor is man aloof from and independent of woman; 12 For as woman was made from man, even so man is also born of woman; and all [whether male or female go forth] from God [as their Author]. 13 Consider for yourselves; is it proper and decent [according to your customs] for a woman to offer prayer to God [publicly] with her head uncovered? 14 Does not [d]the native sense of propriety (experience, common sense, reason) itself teach you that for a man to wear long hair is a dishonor [humiliating and degrading] to him, 15 But if a woman has long hair, it is her ornament and glory? For her hair is given to her for a covering. 16 Now if anyone is disposed to be argumentative and contentious about this, we hold to and recognize no other custom [in worship] than this, nor do the churches of God generally. 17 But in what I instruct [you] next I do not commend [you], because when you meet together, it is not for the better but for the worse. 18 For in the first place, when you assemble as a congregation, I hear that there are cliques (divisions and factions) among you; and I in part believe it, 19 For doubtless there have to be factions or parties among you in order that they who are genuine and of approved fitness may become evident and plainly recognized among you. 20 So when you gather for your meetings, it is not the supper instituted by the Lord that you eat, 21 For in eating each one [hurries] to get his own supper first [not waiting for the poor], and one goes hungry while another gets drunk. 22 What! Do you have no houses in which to eat and drink? Or do you despise the church of God and mean to show contempt for it, while you humiliate those who are poor (have no homes and have brought no food)? What shall I say to you? Shall I commend you in this? No, [most certainly] I will not! 23 For I received from the Lord Himself that which I passed on to you [it was given to me personally], that the Lord Jesus on the night when He was treacherously delivered up and while His betrayal was in progress took bread, 24 And when He had given thanks, He broke [it] and said, Take, eat. This is My body, which is broken for you. Do this to call Me [affectionately] to remembrance. 26 For every time you eat this bread and drink this cup, you are representing and signifying and proclaiming the fact of the Lord’s death until He comes [again]. 27 So then whoever eats the bread or drinks the cup of the Lord in a way that is unworthy [of Him] will be guilty of [profaning and sinning against] the body and blood of the Lord. 28 Let a man [thoroughly] examine himself, and [only when he has done] so should he eat of the bread and drink of the cup. 29 For anyone who eats and drinks without discriminating and recognizing with due appreciation that [it is Christ’s] body, eats and drinks a sentence (a verdict of judgment) upon himself. 30 That [careless and unworthy participation] is the reason many of you are weak and sickly, and quite enough of you have fallen into the sleep of death. 31 For if we searchingly examined ourselves [detecting our shortcomings and recognizing our own condition], we should not be judged and penalty decreed [by the divine judgment]. 32 But when we [fall short and] are judged by the Lord, we are disciplined and chastened, so that we may not [finally] be condemned [to eternal punishment along] with the world. 33 So then, my brothers, when you gather together to eat [the Lord’s Supper], wait for one another. 34 If anyone is hungry, let him eat at home, lest you come together to bring judgment [on yourselves]. About the other matters, I will give you directions [personally] when I come. Now about the spiritual gifts (the special endowments of supernatural energy), brethren, I do not want you to be misinformed. 2 You know that when you were heathen, you were led off after idols that could not speak [habitually] as impulse directed and whenever the occasion might arise. 3 Therefore I want you to understand that no one speaking under the power and influence of the [Holy] Spirit of God can [ever] say, Jesus be cursed! And no one can [really] say, Jesus is [my] Lord, except by and under the power and influence of the Holy Spirit. 4 Now there are distinctive varieties and distributions of endowments (gifts, [a]extraordinary powers distinguishing certain Christians, due to the power of divine grace operating in their souls by the Holy Spirit) and they vary, but the [Holy] Spirit remains the same. 5 And there are distinctive varieties of service and ministration, but it is the same Lord [Who is served]. 6 And there are distinctive varieties of operation [of working to accomplish things], but it is the same God Who inspires and energizes them all in all. 7 But to each one is given the manifestation of the [Holy] Spirit [the evidence, the spiritual illumination of the Spirit] for good and profit. 8 To one is given in and through the [Holy] Spirit [the power to speak] a message of wisdom, and to another [the power to express] a word of knowledge and understanding according to the same [Holy] Spirit; 9 To another [[b]wonder-working] faith by the same [Holy] Spirit, to another the extraordinary powers of healing by the one Spirit; 10 To another the working of miracles, to another prophetic insight ([c]the gift of interpreting the divine will and purpose); to another the ability to discern and distinguish between [the utterances of true] spirits [and false ones], to another various kinds of [unknown] tongues, to another the ability to interpret [such] tongues. 12 For just as the body is a unity and yet has many parts, and all the parts, though many, form [only] one body, so it is with Christ (the Messiah, the Anointed One). 13 For by [[d]means of the personal agency of] one [Holy] Spirit we were all, whether Jews or Greeks, slaves or free, baptized [and [e]by baptism united together] into one body, and all made to drink of one [Holy] Spirit. 14 For the body does not consist of one limb or organ but of many. 15 If the foot should say, Because I am not the hand, I do not belong to the body, would it be therefore not [a part] of the body? 16 If the ear should say, Because I am not the eye, I do not belong to the body, would it be therefore not [a part] of the body? 17 If the whole body were an eye, where [would be the sense of] hearing? If the whole body were an ear, where [would be the sense of] smell? 19 But if [the whole] were all a single organ, where would the body be? 20 And now there are [certainly] many limbs and organs, but a single body. 21 And the eye is not able to say to the hand, I have no need of you, nor again the head to the feet, I have no need of you. 22 But instead, there is [absolute] necessity for the parts of the body that are considered the more weak. 23 And those [parts] of the body which we consider rather ignoble are [the very parts] which we invest with additional honor, and our unseemly parts and those unsuitable for exposure are treated with seemliness (modesty and decorum), 24 Which our more presentable parts do not require. But God has so adjusted (mingled, harmonized, and subtly proportioned the parts of) the whole body, giving the greater honor and richer endowment to the inferior parts which lack [apparent importance], 25 So that there should be no division or discord or lack of adaptation [of the parts of the body to each other], but the members all alike should have a mutual interest in and care for one another. 26 And if one member suffers, all the parts [share] the suffering; if one member is honored, all the members [share in] the enjoyment of it. 27 Now you [collectively] are Christ’s body and [individually] you are members of it, each part severally and distinct [each with his own place and function]. 28 So God has appointed some in the church [[f]for His own use]: first apostles (special messengers); second prophets (inspired preachers and expounders); third teachers; then wonder-workers; then those with ability to heal the sick; helpers; administrators; [speakers in] different (unknown) tongues. 29 Are all apostles (special messengers)? Are all prophets (inspired interpreters of the will and purposes of God)? Are all teachers? Do all have the power of performing miracles? 30 Do all possess extraordinary powers of healing? Do all speak with tongues? Do all interpret? If I [can] speak in the tongues of men and [even] of angels, but have not love (that reasoning, intentional, spiritual devotion such [a]as is inspired by God’s love for and in us), I am only a noisy gong or a clanging cymbal. Eagerly pursue and seek to acquire [this] love [make it your aim, your great quest]; and earnestly desire and cultivate the spiritual endowments (gifts), especially that you may prophesy ([a]interpret the divine will and purpose in inspired preaching and teaching). 2 For one who speaks in an [unknown] tongue speaks not to men but to God, for no one understands or catches his meaning, because in the [Holy] Spirit he utters secret truths and hidden things [not obvious to the understanding]. 3 But [on the other hand], the one who prophesies [who [b]interprets the divine will and purpose in inspired preaching and teaching] speaks to men for their upbuilding and constructive spiritual progress and encouragement and consolation. 4 He who speaks in a [strange] tongue edifies and improves himself, but he who prophesies [[c]interpreting the divine will and purpose and teaching with inspiration] edifies and improves the church and promotes growth [in Christian wisdom, piety, holiness, and happiness]. 5 Now I wish that you might all speak in [unknown] tongues, but more especially [I want you] to prophesy (to be inspired to preach and interpret the divine will and purpose). He who prophesies [who is inspired to preach and teach] is greater (more useful and more important) than he who speaks in [unknown] tongues, unless he should interpret [what he says], so that the church may be edified and receive good [from it]. 6 Now, brethren, if I come to you speaking in [unknown] tongues, how shall I make it to your advantage unless I speak to you either in revelation (disclosure of God’s will to man) in knowledge or in prophecy or in instruction? 7 If even inanimate musical instruments, such as the flute or the harp, do not give distinct notes, how will anyone [listening] know or understand what is played? 8 And if the war bugle gives an uncertain (indistinct) call, who will prepare for battle? 9 Just so it is with you; if you in the [unknown] tongue speak words that are not intelligible, how will anyone understand what you are saying? For you will be talking into empty space! 10 There are, I suppose, all these many [to us unknown] tongues in the world [somewhere], and none is destitute of [its own power of] expression and meaning. 11 But if I do not know the force and significance of the speech (language), I shall seem to be a foreigner to the one who speaks [to me], and the speaker who addresses [me] will seem a foreigner to me. 12 So it is with yourselves; since you are so eager and ambitious to possess spiritual endowments and manifestations of the [Holy] Spirit, [concentrate on] striving to excel and to abound [in them] in ways that will build up the church. 13 Therefore, the person who speaks in an [unknown] tongue should pray [for the power] to interpret and explain what he says. 14 For if I pray in an [unknown] tongue, my spirit [by the [d]Holy Spirit within me] prays, but my mind is unproductive [it bears no fruit and helps nobody]. 15 Then what am I to do? I will pray with my spirit [by the [e]Holy Spirit that is within me], but I will also pray [intelligently] with my mind and understanding; I will sing with my spirit [by the Holy Spirit that is within me], but I will sing [intelligently] with my mind and understanding also. 16 Otherwise, if you bless and render thanks with [your] spirit [[f]thoroughly aroused by the Holy Spirit], how can anyone in the position of an outsider or he who is not gifted with [interpreting of unknown] tongues, say the Amen to your thanksgiving, since he does not know what you are saying? 17 To be sure, you may give thanks well (nobly), but the bystander is not edified [it does him no good]. 18 I thank God that I speak in [strange] tongues (languages) more than any of you or all of you put together; 19 Nevertheless, in public worship, I would rather say five words with my understanding and intelligently in order to instruct others, than ten thousand words in a [strange] tongue (language). 20 Brethren, do not be children [immature] in your thinking; continue to be babes in [matters of] evil, but in your minds be mature [men]. 21 It is written in the Law, By men of strange languages and by the lips of foreigners will I speak to this people, and not even then will they listen to Me, says the Lord. 22 Thus [unknown] tongues are meant for a [supernatural] sign, not for believers but for unbelievers [on the point of believing], while prophecy (inspired preaching and teaching, interpreting the divine will and purpose) is not for unbelievers [on the point of believing] but for believers. 23 Therefore, if the whole church assembles and all of you speak in [unknown] tongues, and the ungifted and uninitiated or unbelievers come in, will they not say that you are demented? 24 But if all prophesy [giving inspired testimony and interpreting the divine will and purpose] and an unbeliever or untaught outsider comes in, he is told of his sin and reproved and convicted and convinced by all, and his defects and needs are examined (estimated, determined) and he is called to account by all, 25 The secrets of his heart are laid bare; and so, falling on [his] face, he will worship God, declaring that God is among you in very truth. 26 What then, brethren, is [the right course]? When you meet together, each one has a hymn, a teaching, a disclosure of special knowledge or information, an utterance in a [strange] tongue, or an interpretation of it. [But] let everything be constructive and edifying and for the good of all. 27 If some speak in a [strange] tongue, let the number be limited to two or at the most three, and each one [taking his] turn, and let one interpret and explain [what is said]. 28 But if there is no one to do the interpreting, let each of them keep still in church and talk to himself and to God. 32 For the spirits of the prophets (the speakers in tongues) are under the speaker’s control [and subject to being silenced as may be necessary], 33 For He [Who is the source of their prophesying] is not a God of confusion and disorder but of peace and order. As [is the practice] in all the churches of the saints (God’s people), 34 The women should keep quiet in the churches, for they are not authorized to speak, but should take a secondary and subordinate place, just as the Law also says. 35 But if there is anything they want to learn, they should ask their own husbands at home, for it is disgraceful for a woman to talk in church [[g]for her to usurp and exercise authority over men in the church]. 36 What! Did the word of the Lord originate with you [Corinthians], or has it reached only you? 37 If anyone thinks and claims that he is a prophet [filled with and governed by the Holy Spirit of God and inspired to interpret the divine will and purpose in preaching or teaching] or has any other spiritual endowment, let him understand (recognize and acknowledge) that what I am writing to you is a command of the Lord. 38 But if anyone disregards or does not recognize [[h]that it is a command of the Lord], he is disregarded and not recognized [he is [i]one whom God knows not]. 39 So [to conclude], my brethren, earnestly desire and set your hearts on prophesying (on being inspired to preach and teach and to interpret God’s will and purpose), and do not forbid or hinder speaking in [unknown] tongues. 40 But all things should be done with regard to decency and propriety and in an orderly fashion. And now let me remind you [since it seems to have escaped you], brethren, of the Gospel (the glad tidings of salvation) which I proclaimed to you, which you welcomed and accepted and upon which your faith rests, 2 And by which you are saved, if you hold fast and keep firmly what I preached to you, unless you believed at first without effect and all for nothing. 3 For I passed on to you first of all what I also had received, that Christ (the Messiah, the Anointed One) died for our sins in accordance with [what] the Scriptures [foretold], 4 That He was buried, that He arose on the third day as the Scriptures foretold, 5 And [also] that He appeared to Cephas (Peter), then to the Twelve. 6 Then later He showed Himself to more than five hundred brethren at one time, the majority of whom are still alive, but some have fallen asleep [in death]. 7 Afterward He was seen by James, then by all the apostles (the special messengers), 8 And last of all He appeared to me also, as to one prematurely and born dead [[a]no better than an unperfected fetus among living men]. 9 For I am the least [worthy] of the apostles, who am not fit or deserving to be called an apostle, because I once wronged and pursued and molested the church of God [oppressing it with cruelty and violence]. 10 But by the grace (the unmerited favor and blessing) of God I am what I am, and His grace toward me was not [found to be] for nothing (fruitless and without effect). In fact, I worked harder than all of them [the apostles], though it was not really I, but the grace (the unmerited favor and blessing) of God which was with me. 11 So, whether then it was I or they, this is what we preach and this is what you believed [what you adhered to, trusted in, and relied on]. 12 But now if Christ (the Messiah) is preached as raised from the dead, how is it that some of you say that there is no resurrection of the dead? 13 But if there is no resurrection of the dead, then Christ has not risen; 14 And if Christ has not risen, then our preaching is in vain [it amounts to nothing] and your faith is devoid of truth and is fruitless (without effect, empty, imaginary, and unfounded). 15 We are even discovered to be misrepresenting God, for we testified of Him that He raised Christ, Whom He did not raise in case it is true that the dead are not raised. 16 For if the dead are not raised, then Christ has not been raised; 17 And if Christ has not been raised, your faith is mere delusion [futile, fruitless], and you are still in your sins [under the control and penalty of sin]; 18 And further, those who have died in [[b]spiritual fellowship and union with] Christ have perished (are lost)! 19 If we who are [abiding] in Christ have hope only in this life and that is all, then we are of all people most miserable and to be pitied. 20 But the fact is that Christ (the Messiah) has been raised from the dead, and He became the firstfruits of those who have fallen asleep [in death]. 21 For since [it was] through a man that death [came into the world, it is] also through a Man that the resurrection of the dead [has come]. 22 For just as [because of their [c]union of nature] in Adam all people die, so also [by virtue of their [d]union of nature] shall all in Christ be made alive. 23 But each in his own rank and turn: Christ (the Messiah) [is] the firstfruits, then those who are Christ’s [own will be resurrected] at His coming. 24 After that comes the end (the completion), when He delivers over the kingdom to God the Father after rendering inoperative and abolishing every [other] rule and every authority and power. 25 For [Christ] must be King and reign until He has put all [His] enemies under His feet. 26 The last enemy to be subdued and abolished is death. 27 For He [the Father] has put all things in subjection under His [Christ’s] feet. But when it says, All things are put in subjection [under Him], it is evident that He [Himself] is excepted Who does the subjecting of all things to Him. 28 However, when everything is subjected to Him, then the Son Himself will also subject Himself to [the Father] Who put all things under Him, so that God may be all in all [be everything to everyone, supreme, the indwelling and controlling factor of life]. 29 Otherwise, what do people mean by being [themselves] baptized in behalf of the dead? If the dead are not raised at all, why are people baptized for them? 30 [For that matter], why do I live [dangerously as I do, running such risks that I am] in peril every hour? 31 [I assure you] by the pride which I have in you in [your [e]fellowship and union with] Christ Jesus our Lord, that I die daily [I face death every day and die to self]. 32 What do I gain if, merely from the human point of view, I fought with [wild] beasts at Ephesus? If the dead are not raised [at all], let us eat and drink, for tomorrow we will be dead. 33 Do not be so deceived and misled! Evil companionships (communion, associations) corrupt and deprave good manners and morals and character. 34 Awake [[f]from your drunken stupor and return] to sober sense and your right minds, and sin no more. For some of you have not the knowledge of God [you are utterly and willfully and disgracefully ignorant, and continue to be so, lacking the sense of God’s presence and all true knowledge of Him]. I say this to your shame. 35 But someone will say, How can the dead be raised? With what [kind of] body will they come forth? 36 You foolish man! Every time you plant seed, you sow something that does not come to life [germinating, springing up, and growing] unless it dies first. 37 Nor is the seed you sow then the body which it is going to have [later], but it is a naked kernel, perhaps of wheat or some of the rest of the grains. 38 But God gives to it the body that He plans and sees fit, and to each kind of seed a body of its own. 39 For all flesh is not the same, but there is one kind for humans, another for beasts, another for birds, and another for fish. 40 There are heavenly bodies (sun, moon, and stars) and there are earthly bodies (men, animals, and plants), but the beauty and glory of the heavenly bodies is of one kind, while the beauty and glory of earthly bodies is a different kind. 41 The sun is glorious in one way, the moon is glorious in another way, and the stars are glorious in their own [distinctive] way; for one star differs from and surpasses another in its beauty and brilliance. 42 So it is with the resurrection of the dead. [The body] that is sown is perishable and decays, but [the body] that is resurrected is imperishable (immune to decay, immortal). 43 It is sown in dishonor and humiliation; it is raised in honor and glory. It is sown in infirmity and weakness; it is resurrected in strength and endued with power. 44 It is sown a natural (physical) body; it is raised a supernatural (a spiritual) body. [As surely as] there is a physical body, there is also a spiritual body. 45 Thus it is written, The first man Adam became a living being (an individual personality); the last Adam (Christ) became a life-giving Spirit [restoring the dead to life]. 46 But it is not the spiritual life which came first, but the physical and then the spiritual. 47 The first man [was] from out of earth, made of dust (earthly-minded); the second Man [is] the Lord from out of heaven. 48 Now those who are made of the dust are like him who was first made of the dust (earthly-minded); and as is [the Man] from heaven, so also [are those] who are of heaven (heavenly-minded). 49 And just as we have borne the image [of the man] of dust, so shall we and so [g]let us also bear the image [of the Man] of heaven. 50 But I tell you this, brethren, flesh and blood cannot [become partakers of eternal salvation and] inherit or share in the kingdom of God; nor does the perishable (that which is decaying) inherit or share in the imperishable (the immortal). 51 Take notice! I tell you a mystery (a secret truth, an event decreed by the hidden purpose or counsel of God). We shall not all fall asleep [in death], but we shall all be changed (transformed) 52 In a moment, in the twinkling of an eye, at the [sound of the] last trumpet call. For a trumpet will sound, and the dead [in Christ] will be raised imperishable (free and immune from decay), and we shall be changed (transformed). 53 For this perishable [part of us] must put on the imperishable [nature], and this mortal [part of us, this nature that is capable of dying] must put on immortality (freedom from death). 54 And when this perishable puts on the imperishable and this that was capable of dying puts on freedom from death, then shall be fulfilled the Scripture that says, Death is swallowed up (utterly vanquished [h]forever) in and unto victory. 55 O death, where is your victory? O death, where is your sting? 56 Now sin is the sting of death, and sin exercises its power [i][upon the soul] through [j][the abuse of] the Law. 57 But thanks be to God, Who gives us the victory [making us conquerors] through our Lord Jesus Christ. 58 Therefore, my beloved brethren, be firm (steadfast), immovable, always abounding in the work of the Lord [always being superior, excelling, doing more than enough in the service of the Lord], knowing and being continually aware that your labor in the Lord is not futile [it is never wasted or to no purpose]. Now concerning the money contributed for [the relief of] the saints (God’s people): you are to do the same as I directed the churches of Galatia to do. 2 On the first [day] of each week, let each one of you [personally] put aside something and save it up as he has prospered [in proportion to what he is given], so that no collections will need to be taken after I come. 3 And when I arrive, I will send on those whom you approve and authorize with credentials to carry your gift [of charity] to Jerusalem. 4 If it seems worthwhile that I should go too, they will accompany me. 5 After passing through Macedonia, I will visit you, for I intend [only] to pass through Macedonia; 6 But it may be that I will stay with you [for a while], perhaps even spend the winter, so that you may bring me forward [on my journey] to wherever I may go. 7 For I am unwilling to see you right now [just] in passing, but I hope later to remain for some time with you, if the Lord permits. 8 I will remain in Ephesus [however] until Pentecost, 9 For a wide door of opportunity for effectual [service] has opened to me [there, a great and promising one], and [there are] many adversaries. 10 When Timothy arrives, see to it that [you put him at ease, so that] he may be fearless among you, for he is [devotedly] doing the Lord’s work, just as I am. 11 So [see to it that] no one despises him or treats him as if he were of no account or slights him. But send him off [cordially, speed him on his way] in peace, that he may come to me, for I am expecting him [to come along] with the other brethren. 12 As for our brother Apollos, I have urgently encouraged him to visit you with the other brethren, but it was not at all his will or [a]God’s will that he should go now. He will come when he has opportunity. 13 Be alert and on your guard; stand firm in your faith ([b]your conviction respecting man’s relationship to God and divine things, keeping the trust and holy fervor born of faith and a part of it). Act like men and be courageous; grow in strength! 14 Let everything you do be done in love (true love to God and man as inspired by God’s love for us). 15 Now, brethren, you know that the household of Stephanas were the first converts and our firstfruits in Achaia (most of Greece), and how they have consecrated and devoted themselves to the service of the saints (God’s people). 16 I urge you to pay all deference to such leaders and to enlist under them and be subject to them, as well as to everyone who joins and cooperates [with you] and labors earnestly. 17 I am happy because Stephanas and Fortunatus and Achaicus have come [to me], for they have made up for your absence. 18 For they gave me [c]respite from labor and rested me and refreshed my spirit as well as yours. Deeply appreciate and thoroughly know and fully recognize such men. From the tone of Paul’s admonitions and exhortations, I get the feeling that he is a little dismayed that the Corinthians are squabbling over . . . well, over everything. It looks as if the “report Paul received” was much more than a passing . . . “Boy those Corinthians!” thrown out in casual conversation. 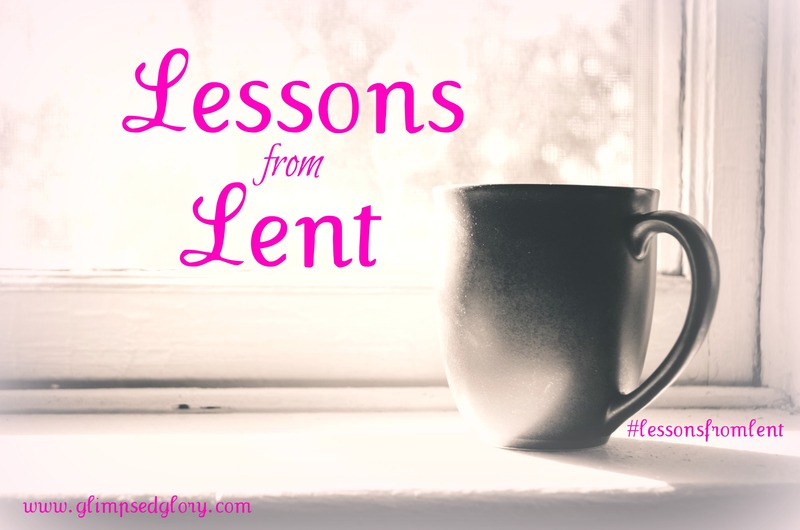 Somebody clued Paul in on every detail and we’re just getting a peek at the highlights, it seems Paul will save the small stuff for when he is actually face-to-face with them . . . .
And those were to be the opening words of Lessons from Lent: Day 26. But the more I pondered over the truth of these passages, I knew I was to be silent on this text and leave you with only one thought . 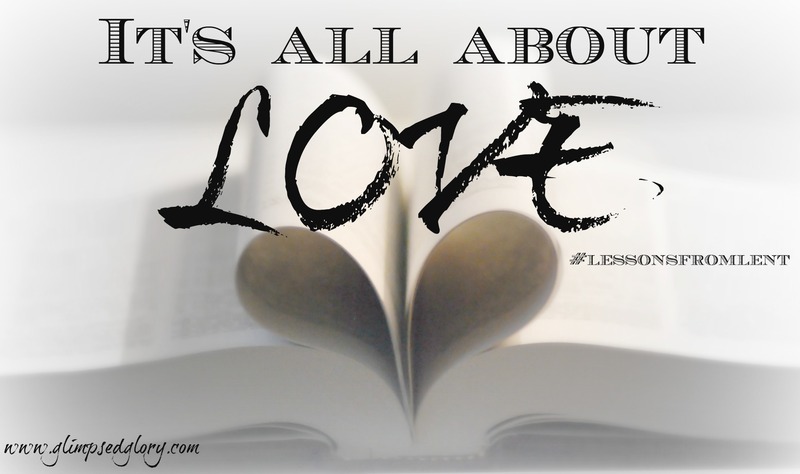 . . No matter what translation we read, it’s all about love.